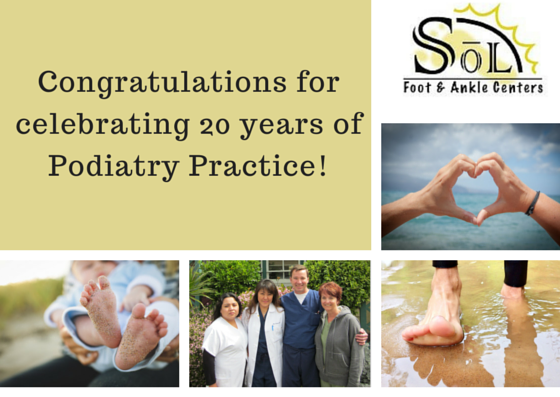 At Sol Foot & Ankle Centers, our experienced podiatrists provide the highest level of expertise in foot and ankle care, while addressing the individual needs of each patient. Our team of dedicated professionals are here to help you with your foot or ankle condition. Our practice is fully equipped with the latest technology including: in-house x-ray, physical therapy services, gait analysis, scanning for custom foot orthotics and advanced laser technology for treating toenail fungus. Our caring staff and experienced podiatrists are committed to providing you with the best care, treatment and education. Whether you're a runner with a new sports injury, or are having pain in your feet from standing all day, we can help! Call (562) 433-0478 to schedule your appointment today. We treat all types of foot and ankle problems. We can even help you get into the right pair of shoes. Give us a call! Common foot and ankle conditions we treat.